When does Emotional Alchemy begin? The course officially begins Monday, February 4th, 2019. 3 months or 13 weeks. We'll wrap up together on May 3rd, 2019. How much time will I need for this course? We recommend dedicating 2-3 hours a week for Emotional Alchemy in order to work through the teaching videos, audio practices as well as attend the live classes. However, we understand you'll be taking this course while working, tending to a family, traveling or a slew of other important responsibilities. There is a built in integration week to catch up as well as an opportunity for you to extend your course access or retake the course in the future if you need more time. Emotional Alchemy is entirely virtual. You will receive your course information and content via email, a private members website, a private Facebook group as well as live on Zoom--our virtual classroom and healing space. You can participate from anywhere in the world as long as you have a wifi connection. The course will be a mix of live classes and pre-recorded teaching videos, practices and worksheets. Who is this course for? How do I know if this is a good fit for me? This course is for spiritual seekers who are overwhelmed deep feelers (hello all you beautiful empaths and HSPs!) and/or avoidant achievers (yes you, my love, who is so busy hustling and achieving that you don't have time to slow down and feel). This course will be a good fit for you if you're ready to face your feeling (even if it's a little scary right now) and you are open and willing to receive support and coaching around this to help you. When will the live classes and healings be? The lives classes and healings are scheduled every two weeks, alternating between Tuesday and Thursdays 6:30-7:45pm CST. If you can't make it live that's totally okay! We are recording every class and will post it on the membership site within 48 hours for you to access and watch the replay. Is there any 1:1 coaching or support in this course/program? No, there is no private 1:1 coaching or sessions with this program (unless you received one as part of our pre-sale bonus offer!). This is a group program. During the live classes and healing experiences, you may receive direct coaching and support on a self-volunteer basis when time allows. If you'd like to upgrade to receive private 1:1 support from Rebecca email her directly at rebecca@workwithsoul.com to receive program costs and information to upgrade. How is Rebecca qualified or well suited to be creating and leading this course? Rebecca Niziol is a certified professional coach through the Institute for Professional Excellence in Coaching with over 4,000 coaching and teachings hours and seven years of experience. She specializes in supporting women transform their emotional world and transform their relationship with themselves. Rebecca brings spiritual tools and emotional practices in down to earth ways and has a knack for subtle yet powerful emotional healing. Rebecca has taught the men's national soccer team, guided a group of over 2,000 people in meditation and led soul practices for billionaires on Richard Branson's private island, Necker Island. Her 1:1 clients rave the Spirit Woman Inner Circle she leads is the most loving and accepting place on the internet. I have a clinically diagnosed mental illness or condition, will this course help me? Yes, you can receive a full refund within the 30-day trial window. Please check out our terms and conditions for full policies on refunds and cancellations. What if something comes up and I can't participate or complete the course on time? You are able to cancel and receive a full refund within our 30 day trial window. 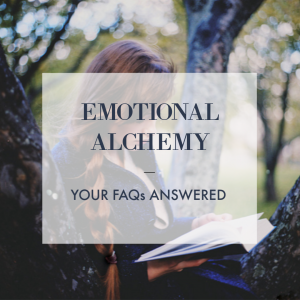 Otherwise you are able to transfer to a later course (if it is still being offered) OR offer your space to someone else you know who wants to join Emotional Alchemy. Emotional Alchemy is open to any gender identification, sexual orientation, race or age. The content and language used was created for women, so if you are a man or identify otherwise and are comfortable with the pronouns she/her used throughout we encourage you to join! Please reach out to us with any concerns so we can improve your course experience. Will you be offering this course again in the future? What if the timing isn't great for me this time? As of now we plan on offering Emotional Alchemy again, knowing that business models and life events can always change plans. If you're interested and able we highly recommend you join the February round as it will be the smallest group and you'll receive the most direct support from Rebecca. We cannot promise the course will be offered again indefinitely or again this year. If you have any other questions please email team@workwithsoul.com for support.